Originally from Madrid, Spain, Joaquin Frias relocated to Detroit, Michigan following the completion of his MBA at Case Western Reserve University in Cleveland, Ohio. While working in the banking industry he recognized a need within the business community for language and cultural training for companies with operations in Spanish speaking regions within the U.S. and abroad. From his experience working in international business as well as with a world renowned cross-cultural agency, Joaquin has developed specialized curricula for language and cultural training programs. This led to the creation of his outstanding Spanish language school in Birmingham. Joaquin is passionate about exposing his clients to comprehensive language and cultural training programs to help them realize their full potential in connecting with the Spanish speaking cultures. The Spanish classes and language courses he created are geared toward helping individuals regardless of their current Spanish speaking capabilities. 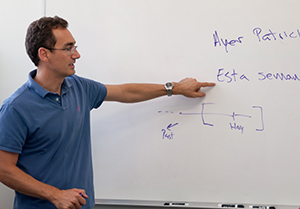 From beginner to intermediate to advanced, he has created Spanish classes for all.